On Wednesday, Nov. 14 at the Main University Campus Store and the University Campus Store Health in HSEB, select Apple products will be available tax-free. Faculty and staff will receive an additional 8 percent off of already reduced academic prices on all MacBook Pros, MacBooks, iPad Pros, iPads and iMacs. This semi-annual sale is exclusively for University of Utah faculty and staff who are invited to save hundreds of dollars on a new Apple device. For those who choose to shop at the main Campus Store, please use the coupon code “UTECH1DAY” at the kiosk to avoid paying any parking fees. All discounted items are limited to on-hand stock on Nov. 14. University of Utah faculty and staff are encouraged to pre-order their desired Apple items by 5 p.m. on Monday, Nov. 12. These pre-ordered items will be in store and ready for pickup at the main Campus Store and the Campus Store Health on the day of the event, Nov. 14. One thing to note when shopping online—sale prices will not appear on the website. Prices will be adjusted at the time of processing your order. If you’d like a specific quote on your product, you may call UTech’s Sales Experts at 801-581-4776 or view the adjusted price sheet on our FAQs page. As an added benefit, full-time faculty and staff are eligible for zero-interest payroll deduction on their new Apple products. Those who use payroll deduction pay only $20 on Nov. 14 and the rest is taken automatically out of their paycheck for up to 12 pay periods. 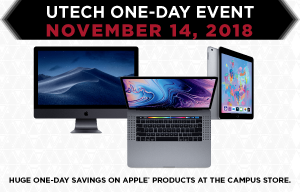 For more information about the University Campus Store’s UTech One-Day Event, please visit the store or call its Apple-certified sales experts at 801-581-4776.